Throughout the season our dances and classes are held at various locations around town. This page will serve as a guide to these places around Anchorage. 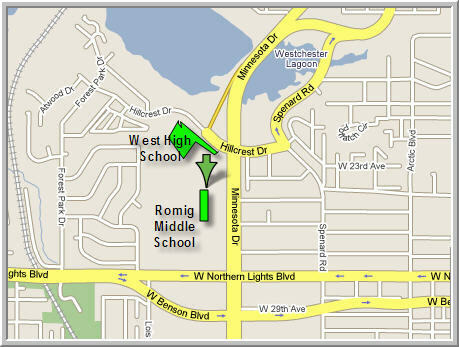 is next to West High School on Minnesota Drive. 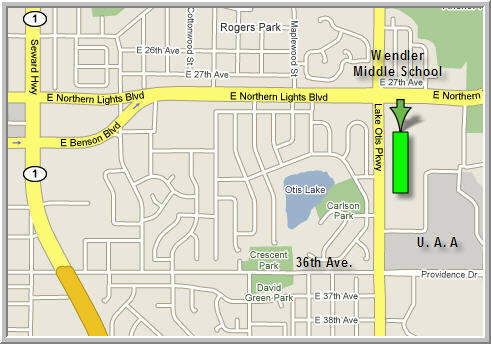 is on Lake Otis between 36th and Northern Lights Blvd. 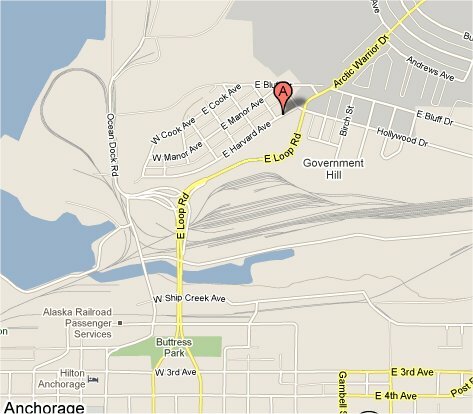 is at 437 E. 3rd Avenue in downtown Anchorage. is at 717 West 3rd Avenue downtown near the Marx Brother's Cafe'. Dancing is usually in the Elk's Club Ballroom adjacent to the Snowgoose. is at 432 East Harvard Ave. on Government Hill. From 3rd Avenue, proceed North across the A street bridge onto Government Hill. Turn left at the light (Tesoro station) onto Erickson St. "Bear" left at the first "Y" on Harvard Ave, then immediately left into the parking lot for the Center. is at 700 G street in downtown Anchorage.